Thursday April 4th - Pigs with Stacy Spangler Join us for a fun evening of painting with Arkansas artist Stacy Spangler! Explore mixed media as we paint pigs on a 12x12 textured canvas. 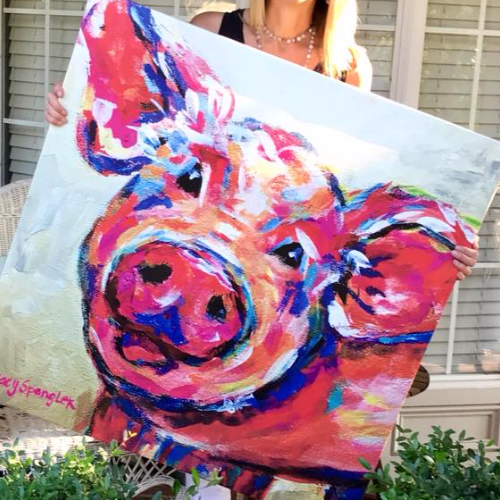 With over 10 years of teaching experience, Stacy will teach her painting techniques and tips for painting a pig in her colorful, whimsical style. Adult workshop-18 spots available. Workshop fee covers all materials and supplies. Pre-Registration is required. Minimum of 6 participants. Class fee is non-refundable unless space is able to be filled.